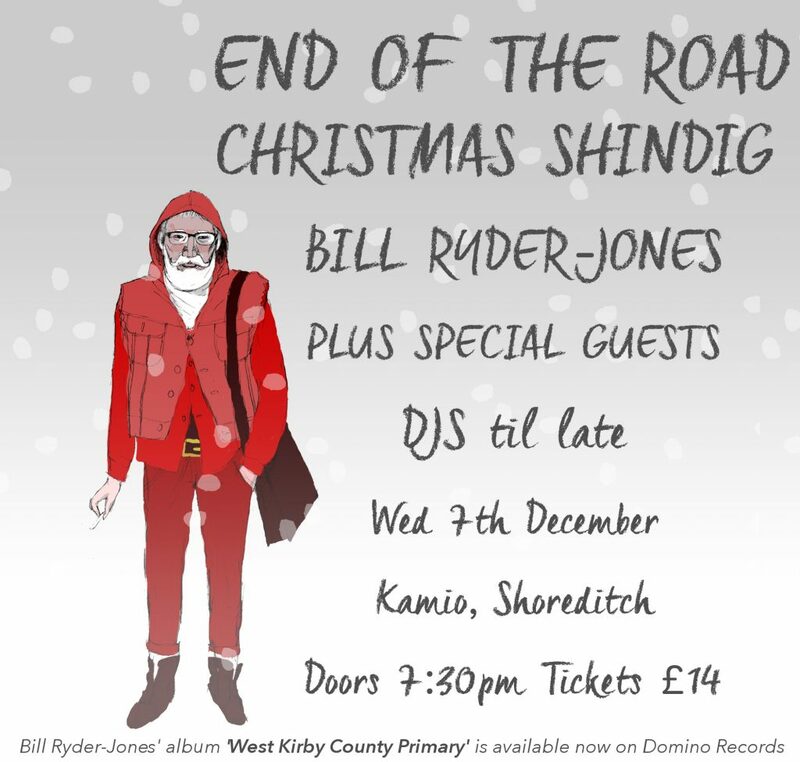 Christmas Shindig on 7 December at Kamio, tickets on sale now! We round off another exceptional year with the announcement of our annual Christmas Shindig, taking place at Kamio on 7 December. Tickets go on sale today at 9am and are available HERE. The festival is thrilled to reveal that Bill Ryder-Jones will headline, fresh from his mesmerising set on this year’s Garden Stage. The celebrations will also include special guest DJs to be announced, who will keep the party going until the small hours. Thank You from End Of The Road Festival! End of the Road would like to say a HUGE thank you to each and every person who came down to this year’s festival. You all made the 11th edition an absolutely incredible one. We are still reeling from all the surprises and once in a lifetime performances! The Shins opened the festival with their first show in three years. Bat For Lashes threw a wild wedding reception and orchestrated an on stage marriage proposal. We danced until we dropped with Jon Hopkins while stunning secret shows from Wild Beasts, Phosphorescent and Ezra Furman thrilled audiences all weekend. We laughed through the rain with the help of Adam Buxton, Stewart Lee and Bridget Christie. We’ve loved every minute of it and we can’t wait to see you all next year. Early Bird tickets go on sale at 7am tomorrow morning. End Of The Road 2016 Has Sold Out! That’s all folks! This year’s End Of The Road Festival has officially sold out. Car (£10) and Campervan (£80) passes will available for sale upon arrival. See you in a few days time for the party of the year! End Of The Road 2016 Stage Times Revealed! With just one week until End Of The Road 2016 opens its gates, we are thrilled to reveal this year’s stage times. To save you some precious time, our friends over at The Line Of Best Fit have put together this nifty clash finder. Visit http://bestf.it/2bpXJd9 to download their tailor-made cheat sheet! Kelley Stoltz has sadly had to cancel his European tour and will therefore no longer be appearing at this year’s End Of The Road. Only 300 Tickets Left and just over Two Weeks to go until End of The Road 2016! Have you seen the news? We’re down to our last 300 tickets! Don’t miss out, grab your friends, grab your wallet and grab your ticket for End of The Road 2016! It’s going to be a magical weekend, and not just because of the exceptional headliners – including The Shins‘ first show in four years, the only chance to see the dazzlingly talented Joanna Newsom in the UK this year, the Technicolor genre-hopping Animal Collective and the otherworldly Bat for Lashes – as everyone who has been to End of The Road knows, it’s all about the new discoveries and secret performances. Who will be popping up at the Piano Stage or singing on the Disco Ship? Anything could happen… Including one more headliner still to be announced for the Big Top on Saturday night, who will be revealed on site! This year for the first time, we welcome cult national treasure Adam Buxton to the festival, who will be recording his much loved ‘ramble chats’ podcast with very special guests to be announced on Saturday. Other one off events include the first in a series of very special pre-release album listening parties for Wilco’s tenth studio album Schmilco, on Saturday morning at the Tipi Stage. The new record will be played on vinyl in full from 11am, before anyone else gets to hear it. As if that wasn’t enough, we are delighted with our Comedy Stage line up, lead by Bridget Christie following her five star show at Edinburgh, the inimitable Stewart Lee, alternative comedy hero Josie Long, acclaimed newcomer Lolly Adefope and Radio 4 regular Andy Zaltzman performing his Political Animal show. Other highlights include the legendary comedian and Comedy Club host Arthur Smith, along with comedy writer turned celebrity Masterchef Hardeep Singh Kohli, hugely respected and wildly popular Adam Bloom and Benedict Cumberbatch’s pal John Finnemore making his debut at the festival. There’s something to please all tastes in the Cinema schedule this year, whether your after an acclaimed documentary such as the visually stunning Mapplethorpe: Look At The Pictures or one of the year’s best independent films Everybody Wants Some!! !, Richard Linklater’s semi-sequel to his 1970s high-school comedy Dazed and Confused. Alternatively if you want to catch up some of 2016’s box office hits, there’s The Jungle Book and Nice Guys, as well as some old hit classics such as E.T., Kes and Being John Malkovich among many others. We also have a very special screenings of the music documentaries The Sad And Beautiful World of Sparklehorse and Invisible Britain: Sleaford Mods, both preceded by Q&As with their directors Bobby Dass and Paul Sng respectively. Along with our usual stellar selection of Workshops and activities taking place in the Wonder Lands and the ever impressive line up of Food & Drinks on offer, including Beavertown taking over the Courtyard Bar this year, End of The Road is set to be one of the best weekends of 2016. Come join us for the party of the year! We are very lucky to have some of the country’s best real ale breweries located right on our doorstep, so for the third year we are running our Real Ale Festival within The Bear Tavern (and across the site). By sourcing our real ale direct from local breweries we get to reduce road miles and support local businesses while serving you some excellent beer. And when we say Real Ale, this is exactly what we mean… Real Ale. Beer that has been brewed by true craft producers, using the best quality ingredients and which has a second fermentation in the barrel allowing us to serve direct from the barrel without the need for extra gas – just the way Real Ale should be, to boost all those amazing flavours. The Bear Tavern will also be home to some free ale tasting at midday each day as well as the opportunity to meet some of the brewers in person and ask some brewing questions (ideal for all you home brewers out there). Check the daily boards for which beers are ready to be served and who is speaking on the day. Below is just a quick run down on who we’ll have on site. Be sure to check our programme for more tasting notes and details. Trail blazing pioneers of the craft beer movement Beavertown are turning our Courtyard Bar into The Beaver Bar for 2016! From their new on site HQ they’ll be serving up trademark brews like their fruit-tinged APA, Gamma Ray, ‘easy drinking’ session IPA, Neck Oil, and their dark smoked porter, Smog Rocket, in addition to the likes of Quelle, 8 Ball, Holy Cowbell and Black Betty! Milk Street Brewery return with another take on an ‘End Of The Road inspired’ Ale. Our namesake brew won’t begin fermentation until next (month/week), so tasting notes are strictly under wraps, but if it’s anything like previous batches we’re in for another delight! Other Milk Street favourites including Funky Monkey and Zigzag Stout will also be available and all beers have vegan options. Our Dorset countryfolk Sunny Republic Brewery bring their delightful Beach Blonde, a lightly malty Pacific Pale Ale headed with a unique blend of Pacific hops that lend a sun-soaked, tropical aroma. They’ll also have full-bodied Huna Red Hibiscus Ale and their zingy Hop Dog, a zesty IPA with a recurrently bitter finish. Handley brewers, Six Penny Brewery, will be on hand with their flagship session ale, 6D Best. A trustworthy, true festival companion brew if ever there was one. Hopback Brewery join us from Wiltshire, armed with batches of their Summer Lightning (allegedly one of the most decorated and award-winning beers in Britain! ), Golden Best and vegan-friendly Entire Stout! Hailing from Salisbury, Wiltshire, Downton Brewery‘s Honey Blonde is a unctuous delight led by spicy and floral hops paired with a rich sweetness of maize and honey. They’ll also have their premium red bitter Route 66, and the complex dark brown ale, Dark Delight. Gyle 59 bring a taste of their vegan friendly ales to be enjoyed by all! Be sure to sample their Happy Daze wheat beer, lit up by banana and coriander, as well as their Freedom Hiker and IPA. Also representing Wiltshire, Stonehenge Brewery with an array of bitters that showcase the precision and variety of master brewers; look out for amber Heel Stone and golden premium bitters Eye Opener and Five Rings. Staying true to their roots, Ringwood are still proudly brewing and plying their maiden beverage, Best, as well as Forty Niner, which they’ve been brewing since 1978! Better still, they’ll be bringing both to Larmer Tree for you to enjoy! From Hampshire, Long Dog Brewery bring their ideal thirst quencher Golden Poacher, as well as true-to-tradition English best bitter, Brindle, and their golden ale, Kismet. Hailing from The New Forest, Vibrant Forest Brewery are in attendance with Nova Foresta, a refreshing amber bitter and Flying Saucer, a zesty golden beer with a palate-tingling bitter finish. The Brew Shack bring a range of their vegan-friendly, small batch brews to End Of The Road, including Amber Gambler, Pale Ale and 8 Grain Porter. Wimborne’s Eight Arch Brewing Co. will join us with a range of beers that includes their CAMRA Dorchester 2016 ‘Beer of the Festival’, Parabolic! Hampshire’s Flower Pots Brewery are aboard and they’re bringing their acclaimed Hampshire Beer Of The Year (2015) Perridge Pale, Flowerpots Bitter and Hampshire Beer Of The Year 2013 AND 2014, Goodens Gold! On top of our exceptional Music, Comedy and Literary bills, we’ve also been busy putting together our Cinema schedule, featuring our usual array of old classics mixed with some of this year’s standouts. There’s something to please all tastes this year, whether your after an acclaimed documentary such as the visually stunning Mapplethorpe: Look At The Pictures or one of the year’s best independent films Everybody Wants Some! !, Richard Linklater’s semi-sequel to his 1970s high-school comedy Dazed and Confused. Alternatively if you want to catch up some of 2016’s box office hits, there’s The Jungle Book and Nice Guys, as well as some old hit classics such as E.T., Kes and Being John Malkovich among many others. We also have a very special screenings of the music documentaries The Sad And Beautiful World of Sparklehorse and Invisible Britain: Sleaford Mods, both preceded by Q&As with their directors Bobby Dass and Paul Sng respectively. Also in this category is Greg Butler’s documentary The Ambiguity Of Thomas Broughton, which follows Broughton from his hometown in West Yorkshire to a climatic set at End Of The Road where he serenades a half eaten sausage. Ideal viewing at this year’s festival! And finally, in honour of David Bowie and Prince who we sadly lost this year, we will be screening Purple Rain and Labyrinth on Thursday night. Tickets for this year’s festival won’t be available for long, so if you haven’t grabbed yours yet, get one HERE and don’t miss out. End Of The Road is your only chance to see the dazzlingly talented Joanna Newsom in the UK this year, as well as The Shins‘ first show in four years, the Technicolor genre-hopping Animal Collective and the otherworldly Bat for Lashes’ first festival headline slot since the release of her acclaimed new album The Bride. End Of The Road Workshops & Activities Announced and just Eight Weeks To Go! With just eight weeks to go until End Of The Road Festival opens its gates, we are delighted to share details of our very popular workshops and activities taking place in the Wonder Lands. If you fancy exercising your creativity, you can have a stab at everything from Clay Creations and Origami, to Screen Printing and even comic books with the Crazy Comic Club, run by the satirical cartoonist James Parsons. There’s plenty for the crafty types as well with some Willow and Wire weaving, as well as the chance to make yourself some jewellery in the Enamelling workshop. For the extroverts among you, we have a wealth of performing arts workshops including Singing Loudly For All To Hear, who will be putting together an End of The Road choir. Or tread the boards with The One Line Theatre company who will be creating an original and usually hilarious piece of theatre using spontaneous and sporadic sentences plucked from the brains of the unsuspecting public. Or discover spontaneous comic within with the Improvisational Comedy workshop, who use games and activities designed to ‘liberate you from thinking, planning or judging’. The kids will be kept entertained (and some adults, no doubt!) with the usual variety of story telling from old favourites to new classics, along with Painting For Kids, the El Baldiniho Magic Show and for the more inquisitive, the Mini Professors workshop will allow children can explore the exciting scientific world of water pressure, bubbles, fossils and much more. If it’s inner peace you’re craving after all that excitement, there will be Yoga, Meditation and Qigong workshops, or if it’s soul food you’re after you can make your own pitta bread with Pizza Tabun. Shh We Have a Plan! Wendy the Wide Mouthed Frog! We are delighted to announce the day splits as well as some extra additions to this year’s already extraordinary line up. The Shins will open the festival and play their first UK show in over four years (their only UK festival in 2016) on The Woods Stage on Thursday night, supported by new line up additions Teleman. Technicolor, genre-hopping, experimental vocal harmonising one-offs Animal Collective will follow on Friday night. Bat for Lashes, who has long been on the festival wish list with her unique brand of otherworldly pop, plays End of The Road for the first time on Saturday while the inimitable Joanna Newsom will close The Woods Stage on Sunday with her harp-led sonic odyssey, playing her only UK festival this year. Meanwhile Scottish genre-defining alt-rock heroes Teenage Fanclub will close the festival with a late Big Top headline slot on Sunday night (playing after Joanna Newsom), where the likes of Steve Mason and Cat’s Eyes will have lit up the stage the night before. The Garden Stage will see the mercurial and mesmerising singer-songwriter Cat Power play End of The Road for the first time on Friday, followed by one of today’s new additions, the gender and genre defying Ezra Furman, who returns to the festival to headline on Saturday night. The iconic Garden Stage will also play host to John Dwyer’s peerless Thee Oh Sees, rounding off a flawless Sunday night bill after Thurston Moore Group and Kevin Morby. 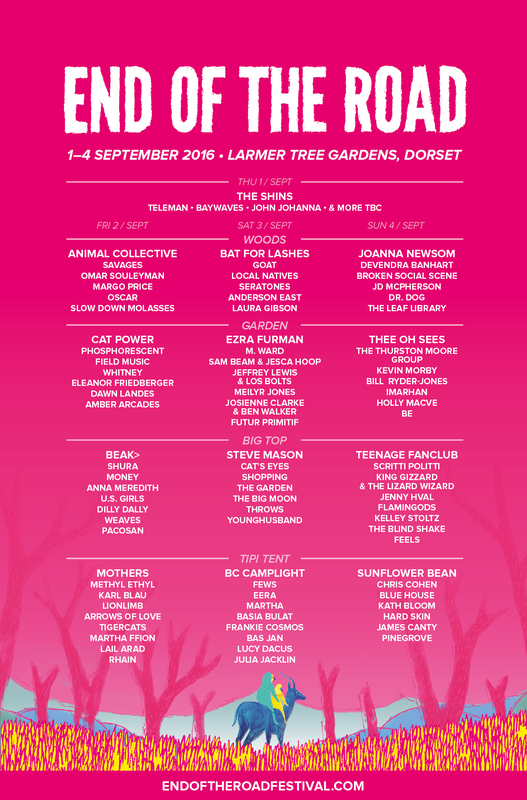 The Tipi Stage plays host to a wealth of new talent this year with Mothers headlining on Friday and Sunflower Bean headlining on Sunday. We are also delighted to finally welcome BC Camplight to End of The Road, who played our Rough Trade takeover event last month and now headlines the Tipi stage on Saturday. Other Tipi highlights include rising stars Frankie Cosmos on Saturday and Karl Blau on Friday. In addition to all this, throughout the four days, there will be the usual array of surprise performances, one off collaborations and secret sets – presented in collaboration with The Line of Best Fit – that have become End of The Road’s trademark. Uncut will be returning to host their daytime artist Q&As and there will be a variety of after hours fun and dancing to be had at the Silent Disco, The Disco Ship and Bat for Lashes’ ‘wedding reception’ hosted by Loud & Quiet (with very special guest DJ’s to be announced) after her headline set of The Bride on Saturday. Details of set times will be released closer to the festival and will be staggered to avoid clashes where possible. We are delighted to announce this year’s Literary line up, showcasing some of the best of the current crop of acclaimed writers. As usual, during the morning of each day of the festival we will be welcoming a selection of authors to read from and discuss their work at The Library Stage. We have curated a diverse line up this year that ranges from Brix Smith discussing her turbulent years with The Fall; to Vincent Thurkettle, a woodsman, who will be giving you practical tips on how to light the best log fire. We also have pop-cultural noir novelist Cathi Unsworth reading from her latest acclaimed work Without The Moon; Travis Elborough on the social history of parks; Sally Bayley on the art of diary keeping from Pepys to Tweets; Roddy Woomble on life on Iona and his new almanac of thoughts and ideas; Barney Hoskyns on the bohemian enclave of Woodstock and Hefner’s Darren Hayman on his Thankful Villages. We are also very excited to share this year’s Comedy Stage line up, boasting one of the strongest and most diverse line-ups of the summer. Joining Stewart Lee on the comedy bill we have a mixture of stand ups, sketch, character, musical comedy and political satire in store for 2016. First up, acclaimed comedian and columnist Bridget Christie. Having won more awards than you can shake a biro at, Christie is a familiar name to many and for good reason. Her breakout show A Bic for Her and follow-up Ungrateful Woman were critically-acclaimed – leading to sold out shows across the country. Festival favourite Josie Long also makes a long awaited return to the End of The Road, bringing her unique brand of surreal political satire to this year’s comedy line up. As if that wasn’t enough, the inimitable ‘satirist for hire’ Andy Zaltzman will bring his Political Animal show to the festival, including his usual array of guest speakers. Fellow Radio 4 regular and TV writer John Finnemore is best known for airline-based Radio 4 sitcom Cabin Pressure starring Benedict Cumberbatch, radio sketch show John Finnemore’s Souvenir Programme, and will make his debut at the festival with a very special Sunday night featuring an equally special guest.